The fire left just a shell of what was a portable classroom. 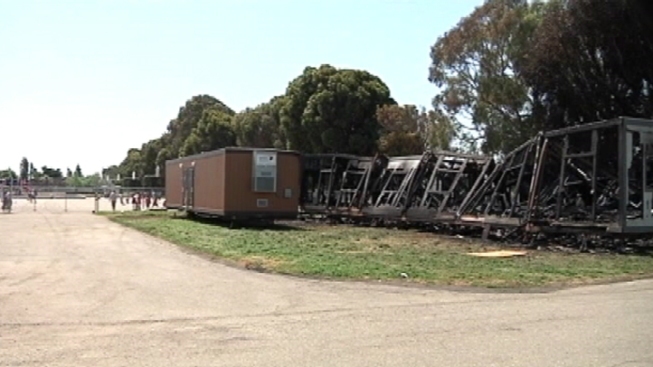 A fire that destroyed six portable units on San Leandro Unified School District property early this morning is considered suspicious, a fire department spokeswoman said today. The fire at 14735 Juniper St. was reported at 12:12 a.m., according to the Alameda County Fire Department. When firefighters arrived, the portable units were already fully involved in flames. Initially reported to be at the neighboring James Madison Elementary School, the fire actually took place in portable units on a school district parking lot next door, department spokeswoman Aisha Knowles said. The fire, which started inside the units, is considered suspicious, but investigators have been hindered by the extensive damage to the structures, which has made it unsafe for them to examine the interiors. As a result, Knowles said, it has not yet been determined if the fire was an act of arson or accidental. Knowles said the units were brand new, having been delivered only the day before. Superintendent Cindy M. Cathey in a statement today said the fire destroyed a large portable classroom that was to house district staff during renovations of the main building. "The portable classroom was in multiple sections as it had not yet been put together," Cathey said. No one was injured in the fire, Cathey said. The area has been declared a crime scene while police investigate.